The UNB Hockey Fellows Society was officially launched on March 17, 2017 during the Cavendish Farms UCup Men’s National Hockey Championships at the UNB Aitken Centre. Close to 60 returning hockey alumni received the first Fellows Society Medallions during the national championship legacy dinner. Later in the spring, graduating members of the Varsity Reds 2017 UCup championship team received their medallions. The UNB Hockey Fellows Society medallion was designed in conjunction with Corey Pacione, owner of Creative Juices, and is cast by Fredericton craftspeople at Aitkens Pewter. The medallion features the date 1905, officially regarded as the first year of varsity hockey at UNB. The Hockey Fellows Society was a vision put forth by Dave Morell (Red Devils Manager 1969-72) upon his retirement following 15 years as Varsity Reds Marketing and Special Events manager. The Hockey Fellows Society, open exclusively to all former UNB hockey players, coaches and support staff, is designed to foster a closer relationship between UNB’s hockey past and present. 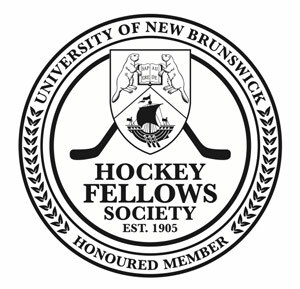 All hockey alumni are now considered 'honoured members' of the Fellows Society, an organization controlled and operated by hockey alumni. Hockey alumni are considered the builders, believers and protectors of the UNB program and the Fellows Society enhances that vision. Through the Fellows Society, former team members will be able to connect with teammates, while interacting with the current Varsity Reds program on a regular basis. There is also a very important opportunity for alumni to show their support in financial ways. During the 2018 UCup Championships, March 16-18 at the Aitken Centre, Fellows Society medallions will be presented to all returning hockey alumni during the Legacy Dinner on Friday, March 16 at 4:30 p.m. in the Wu Conference Centre. The medallions will be presented by UNB President Dr. Eddy Campbell and Varsity Reds head coach Gardiner MacDougall. At last year’s Legacy Dinner the 2007 Varsity Reds national champions were honored. This year’s dinner will proudly salute the 1998 team, winners of the first men’s hockey gold medal in UNB history. We welcome all former UNB hockey team members to the Fellows Society. You have earned your place in UNB hockey history. Please contact Shonda Cotton for information about the upcoming Legacy Dinner. Make a gift to the Varsity Reds men's hockey team.